Over the years, I have seen these tropical plants around the offices that I have worked in, the hotels that I have stayed at, and even in some homes that I have visited. 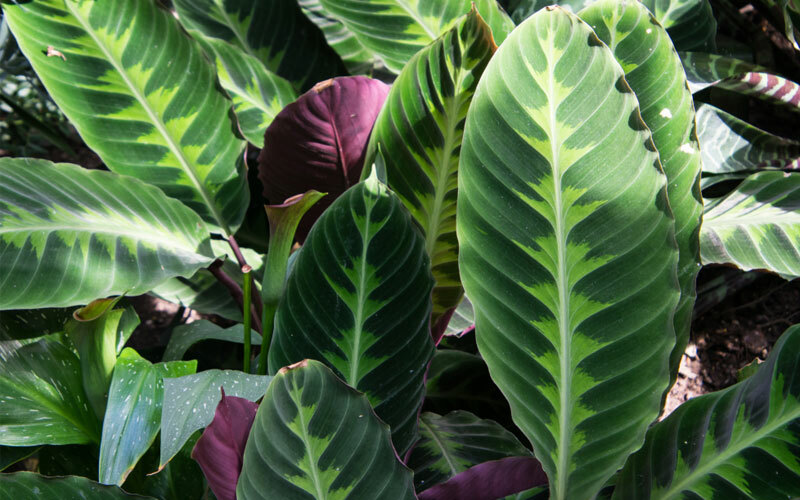 Calathea plants have beautiful green foliage that have bold stripes that vary in color based on their species. 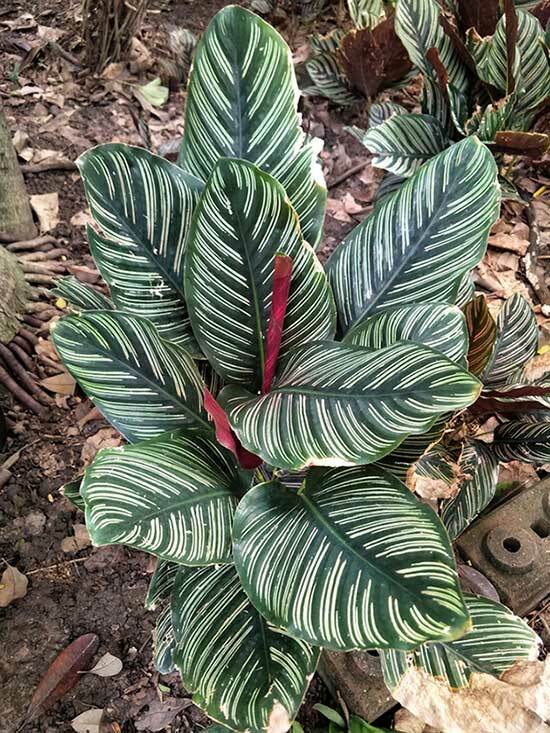 I love the look of these plants, so I decided to look into the growing conditions that a calathea requires to grow so that I could add them to my collection of indoor plants at home. They are native to the rainforests of South Africa, but in the early 1970s, they were introduced to Hawaii and eventually spread to other parts of the United States. These plants are considered to be a sign of a new beginning and often called the prayer plant. They are also great for removing toxins from the air, so when you clean your home or office, you will not smell lingering chemicals with these plants in the space. These plants are commonly seen in office buildings because they are simple to care for, but they do need a certain amount of light, water, and humidity to prosper. Without the proper care, these plants can be fussy and difficult, so it is essential to know what this plant requires to thrive. With the right care, they can quickly grow up to two feet during the growing season. Below we’ll go over some basic tips on how to care for this plant. The plant is not too picky when it comes to soil, but it needs to be planted in a lightweight soil that retains some moisture but is it porous enough to drain any excess quickly. Since you do not want the soil to hold too much moisture, something like organic African violet potting soil would be an excellent option for this plant. This is a plant that requires a lot of light each day, but direct sunlight can be problematic for the plant because it can burn the leaves and cause the color to fade. This is mainly because these plants are jungle plants, so they grow on the forest floor where they are shaded from the sun by the foliage above. If there is an area in your home that is shaded from the sun, this plant will likely do well there. This plant is used to warmer climates, so it will do best in an area where the temperature is between 65 and 80 degrees Fahrenheit. Higher temperatures will cause the leaves to roll to protect them from the heat, while cooler temperatures can damage the plants and stunt their growth, so make sure the temperature in your indoor space is just right when you are trying to grow these plants. Also, make sure to keep the plant away from drafty windows and doors so that the plant does not go into shock from the cold. They also like humidity in the air so that they can absorb the moisture through their leaves like they would in their natural environment. When the leaves are too dry, they tend to brown a bit around the edges, so if you cannot create a greenhouse effect in your home, you may want to place a humidifier near the plant to increase the amount of moisture in the air. The air in the room should be above 50 percent. These plants like to have moist soil, so it is important that they get enough water. However, too much water can drown the plants, so you will need to keep the soil moist, but not soggy. Never keep a calathea plant in standing water because it can cause root rot, which can kill the plant if left untreated. Also, this plant is really picky when it comes to the type of water that it gets. If the water is too hard, too soft, has too much fluoride, has too many minerals, or is simply poor quality, the plant will brown. Distilled water or rainwater is going to be the best option for this plant. This is a plant that does not need to be fertilized much to thrive, but if you want to encourage flowering to occur on the plant, then a little bit of houseplant fertilizer will be good during the growing season. Just make sure that you do not continue to fertilize the plant during the colder months when it is not growing. Calathea plant will not need to be repotted often, but it is a good idea to repot it once a year to make sure that the soil has enough nutrients in it for the plant to grow and that the roots have not grown to be too big for the pot that the plant is currently in. If you do need to repot the plant, try a well-draining pot that will look nice in your home. The only time that this plant will need to be pruned is when it is getting too much or too little sunlight because this will cause the leaves to brown. As soon as you see the leaves turn yellow or brown, use a pair of gardening shears to remove the damaged part of the leaves. When the plant that you are growing begins to get too large for your space, you can easily divide the plant to create two separate plants. This process should be done when you repot the plant each year, and the new plants that are formed will need a lot of heat and humidity as well as reduced sunlight to take hold and start growing again. These plants can also grow from cuttings, but when the roots are attached, they will begin growing actively more quickly. 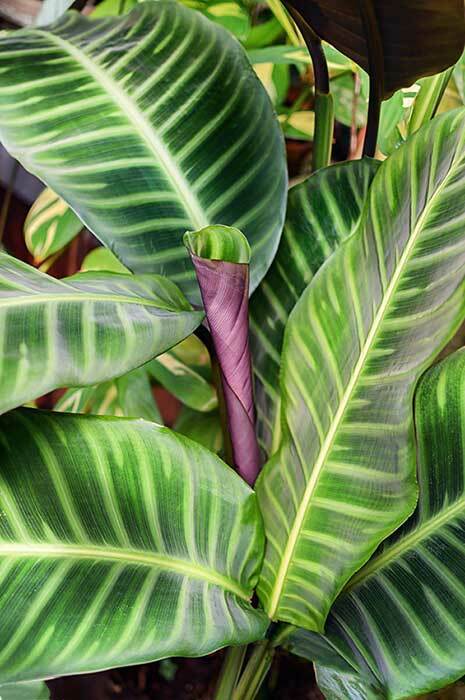 Calathea Makoyana – This is also known as the peacock plant because it has bright purple markings on the underside of the leaf. These plants can grow to be two feet tall in most homes. 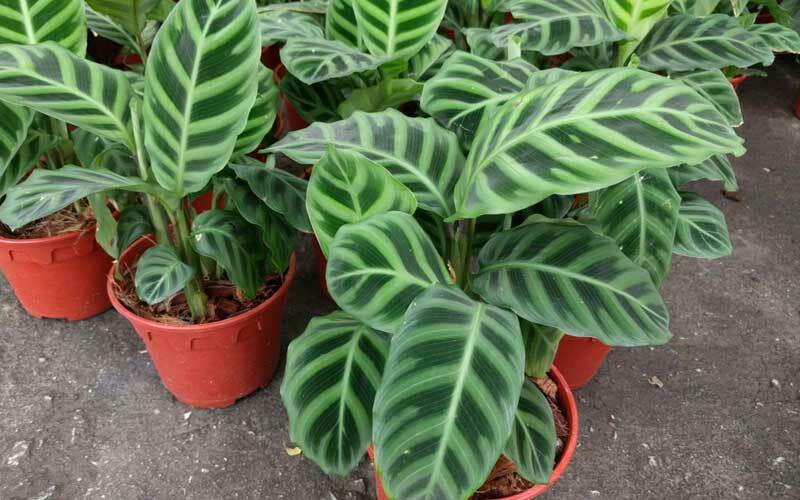 Calathea Zebrine – Also known as the zebra plant, this species has foliage that is striped. This plant can easily grow to be up to three feet tall. 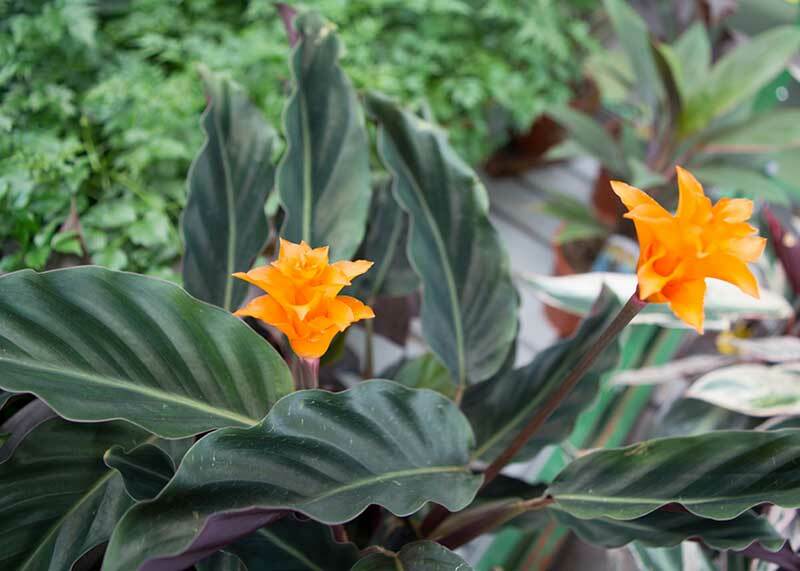 Calathea Crocata – Also known as the eternal flame, this plant will grow to be about two feet tall and produce bright orange flowers. 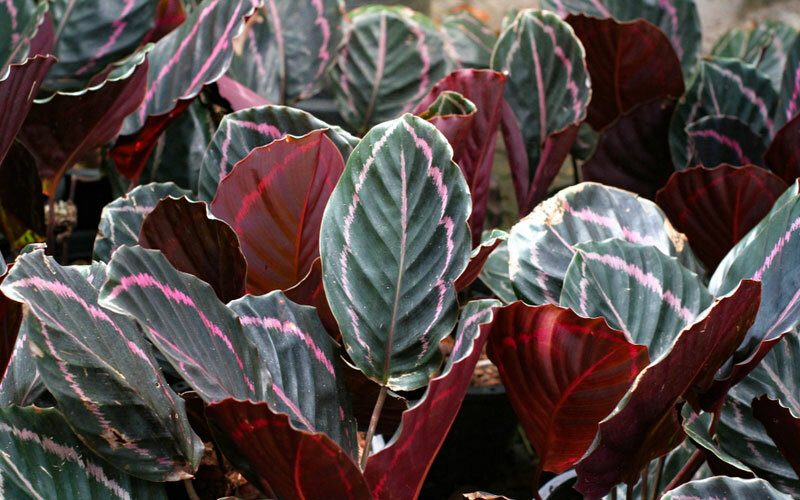 Calathea Ornate – Known as the femme fatale, this plant has unique foliage that has pink and white markings on top of the leaves and purple bottoms. 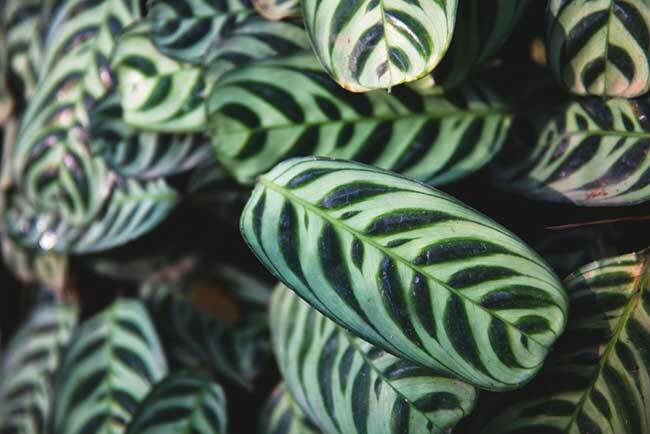 Browning Leaves – This is something that tends to occur when Calathea plants are not getting the right amount of humidity. To stop the leaves from browning, cut off the affected area and increase the amount of humidity in the room. Drooping Leaves – This could be a sign that you are giving the plant too much water. It could also be a sign that there is a draft in the room that is exposing the plant to colder temperatures than it likes. Move the plant to a warmer area of the home, and refrain from watering it until the top of the soil is dry to the touch. Faded Leaves – This happens when the plant is exposed to direct sunlight for an extended period. These plants cannot thrive in direct sunlight, so find an area where the plant will not be in the sun to bring the color back to the foliage. Pests – Spider mites, mealy bugs, aphid, and caterpillars can all chew on these plants, which can harm the plant and stunt its growth. To avoid these pests, inspect the plant and the soil regularly. Spraying the leaves can help keep the pests under control to some degree. 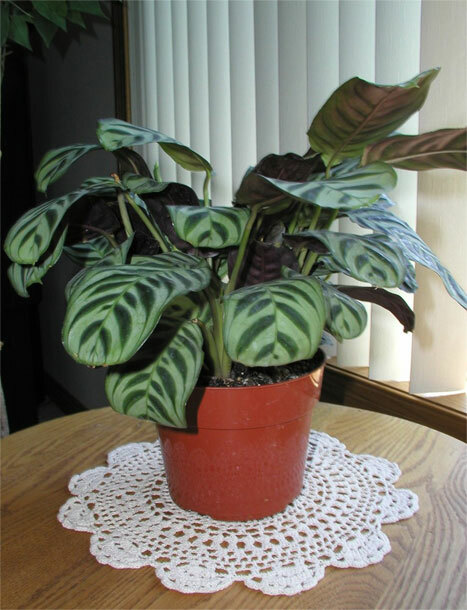 The calathea plant is non-toxic for dogs and cats who may decide to chew on a leaf while it is growing in your home. Of course, you will want to try to train your pets to stay away from these plants so that the calathea can grow, but if your pet does get into the plant, they will be fine.